Grows in gardens or on walls. Mainly planted. Leaves glossy and with five large rounded lobes. Fruits are pear-shaped figs held upright. 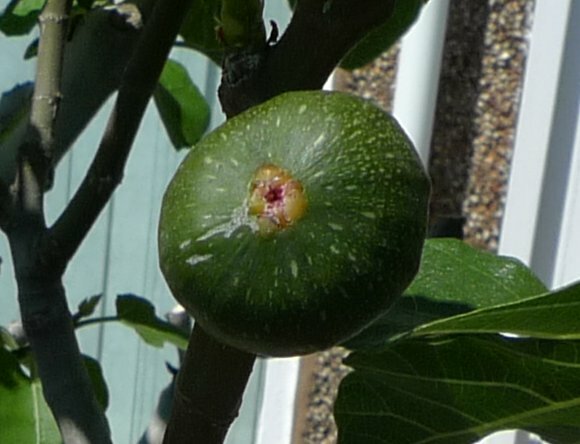 Fruits are pear-shaped, green with perhaps intermittent yellow striations. Leaves have five prominent veins on the rear along the centre-line of the lobes. Fruits are just below the leaves. The plump end of a fig showing the ostiole where the Fig Wasp may enter to pollinate the fig (see below). Leaf lobes number five; smaller away from the main lobe axis. Leaf veins on upperside are light green. A satin sheen rather than high-gloss. All the bark is a matt silvery grey. Some similarities to : Climbing Fig (Ficus pumila), but that one climbs. Much more likely to be found growing planted in a garden or park than wild on a wall or disturbed ground. Except for urban woodland in Sheffield where apparently it grows quite abundantly. In Clumber Park maybe? There are several cultivated varieties; it is not know which one(s) are represented above, but both were growing in house gardens. 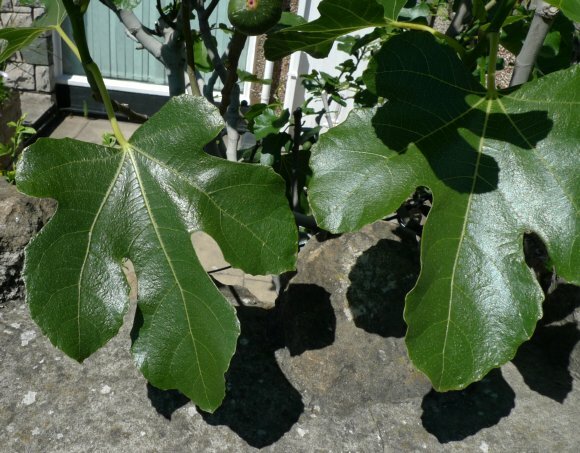 Fig is un-usual, in that the fig is not the fruit of the tree, but actually the inflorescence (or 'flower'), but it is not a flower, rather a false fruit. 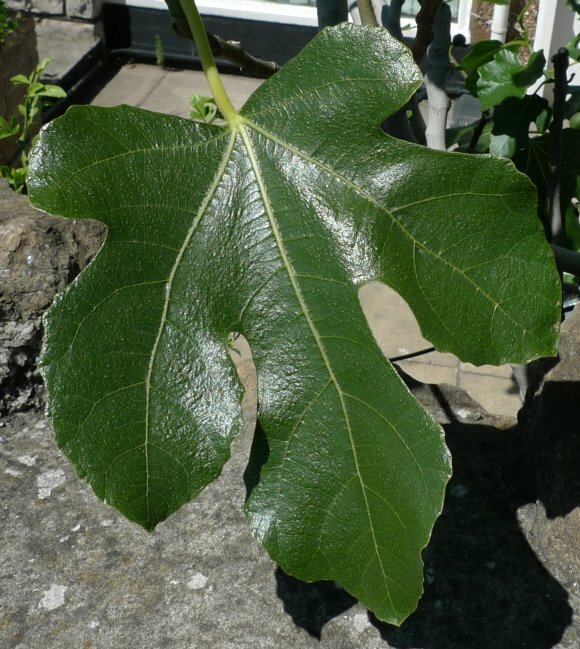 The flower itself is within the fig, and is therefore not visible unless the fig is cut open and dissected. 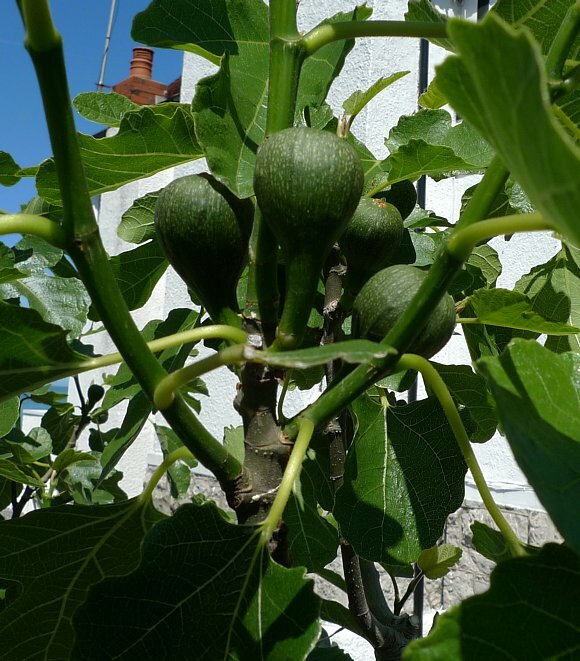 The end of the fig has an orifice in the centre, more correctly called an ostiole where a very small and highly specialised wasp, the Fig Wasp , enters and pollinates the internal 'flower', which then go on to produce seeds, again within the fig. 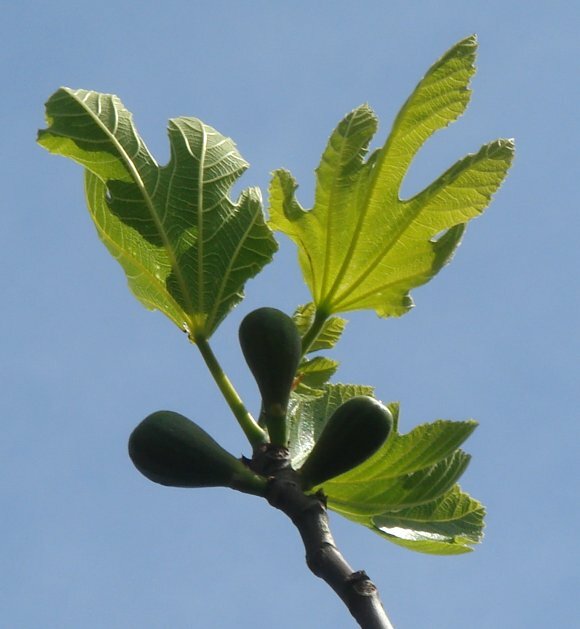 However, Common Figs (those commonly grown in gardens) do NOT require pollination to produce figs; their fruit develop by the parthencarpic process. 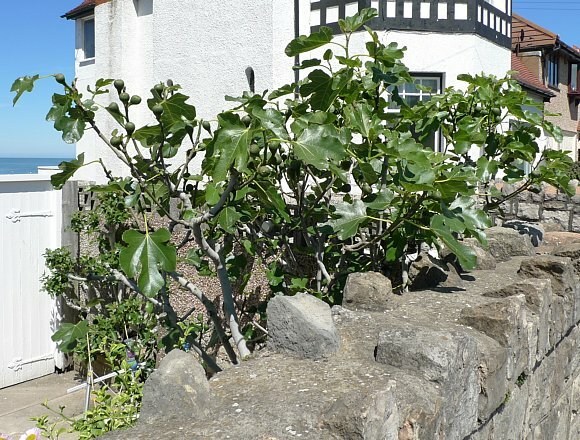 The Fig Tree can produce two crops of figs every year, those that grow on last years growth and ripen first (in the spring) and those that grow on new shoots and ripen secondly (in the summer), The second crop are usually superior in taste and quality except on certain varieties where the first crop are better. Figs have a laxative effect when eaten. 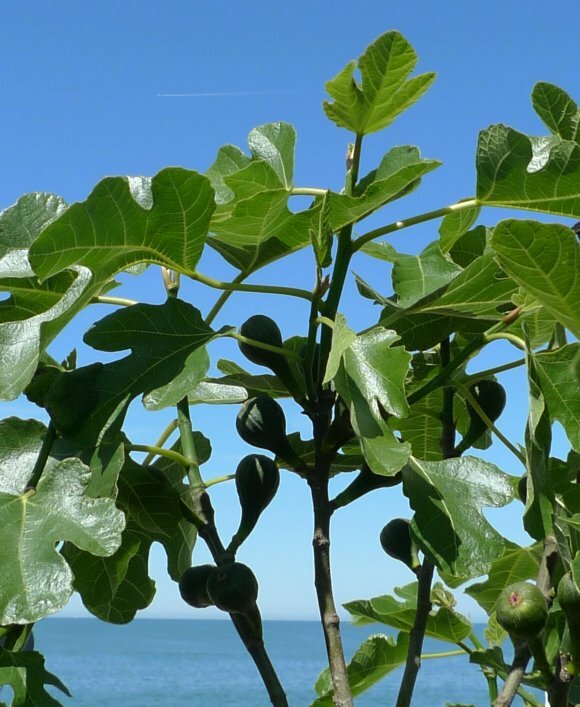 Fig is one of the sweetest 'fruits' known, and has in the past been used as a sweetener. The sweetness is not due most to fructose, but fig does contain other monosaccahrides such as galactose and glucose plus trace amounts of ribose, xylose, arabinose, maltose and lactose. It also contains some sucrose (common sugar). 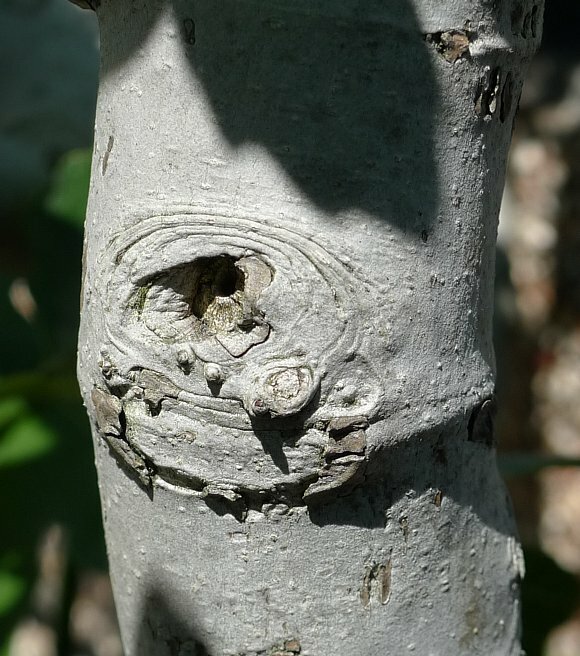 Broken stems will ooze a milky latex that can initiate an allergic reaction or skin irritation in certain susceptible individuals if it gets on the skin.